BMT Myrtle Avenue Line at Central Avenue, R-160A-1 no. 8632 on "M". Photo by Richard Panse, September 2008. Today's Myrtle Ave. line is a shadow of a former line which ran from downtown Brooklyn (Jay Street) to Broadway/Myrtle upper level where it continued along this right of way. Original service patterns had the line continuing past Jay St. to Park Row in lower Manhattan via the Brooklyn Bridge. Through 1959, the line south of Broadway was operated with old Brooklyn Union/BRT open gate cars, then until 1968 using the BMT-modified "Q" cars. This line was the last in the city still using wooden-body el cars. The northern portion of the line (north of Broadway) was rebuilt to heavier standards and some service ran from the Broadway line north to Metropolitan Ave. Today's M train runs from Metropolitan to Broadway/Myrtle lower level at all times. During rush hours and middays it continues along the Jamaica line and Williamsburg Bridge, then via the Chrystie St. Connection to the IND 6th Avenue Line. It then crosses into Queens via the 53rd Street Tunnel and runs local along Queens Boulevard to Forest Hills. Lower Manhattan and Brooklyn M service was discontinued for the new Midtown and Queens M service in June, 2010. Broadway-Myrtle Avenue Connection. Incline from Myrtle Avenue toward Broadway. PSC report 1914. Broadway-Myrtle Avenue Connection. 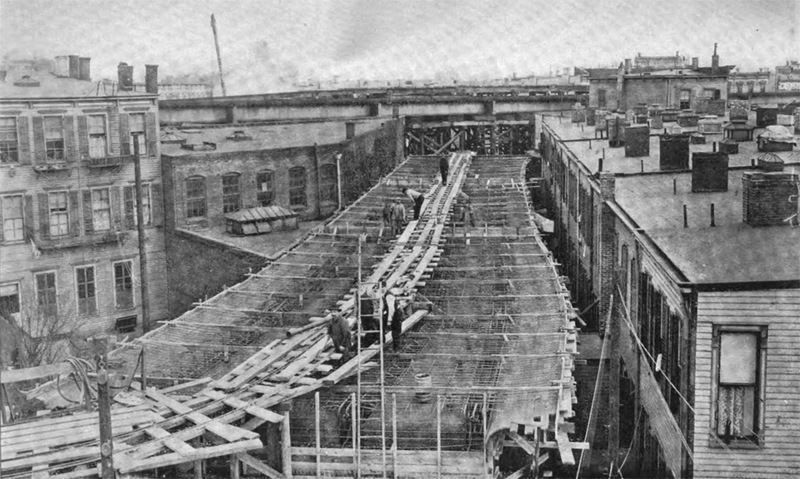 Forms and reinforcing rods, reinforced concrete construction for track deck between Broadway and Myrtle Avenue. PSC report 1914. Two tracks, two side platforms. The platforms are very narrow on the north end, and a small wooden mezzanine. There is a crossunder. The northbound platform's southern half has vertical windscreen with a small gap near the top and no windscreen on the northern half. The southbound platform features vertical windscreen on the northern half. Evidence present at this station leads me to a theory that the southern mezzanine was removed. Evidence includes a patch in the windscreen, suddenly narrowed platforms, and a patch in the concrete where the stairs would have been. Artwork Generation Dynamica, George Bates, 2013. Two tracks, two side platforms. This station features a possible removed southern mezzanine. There is a crossunder. Fully renovated in 2013. Artwork The Digs, Cal Lane, 2014. This interesting station has two island platforms with two side tracks and a gap in the middle which once was a third trackway, now railed off. In the center of the station the two island platforms are joined into one wide platform with two stairways down to the mezzanine. After the stairs the center of the platform turns to wood for a brief section before ending and we once again have two island platforms. A look over the rail revealed a section of concrete cross ties for a third trackway. A passageway leads to a long escalator to descend to the BMT Canarsie line. A close observation reveals evidence where street stairs from this level were removed and this mezzanine reduced in size. After leaving this station the line narrows to two tracks. More on the third track mystery, from a Transit Museum tour of the area hosted by Joe Cunningham: This stretch of the line was originally built as two tracks and the third track was added later, but the center track was never used in service. 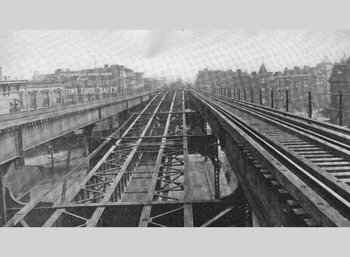 It ran from Broadway/Myrtle to Myrtle/Wyckoff where the line became two tracks. Myrtle/Wyckoff was originally two isalnd platforms. 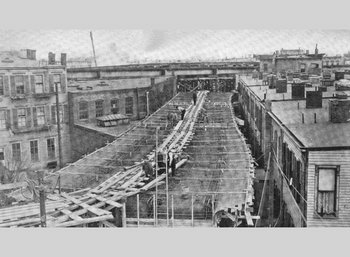 When the center track was finally removed in 1946, pipe railings were put to prevent falls where the center track used to be. Eventually, wooden planking was placed in the space to make one extra wide island platform. The wood is rotting and is being replaced again by pipe railings. Artwork From Earth To Sky, Cadence Giersbach, 2007. Located in the transfer between "L" and "M" trains. This station has an island platform, with a mezzanine to the fare control and the street. In a note of comfort, there is a heater in the mezzanine which looks like it runs on steam or kerosene. This station also has a removed south mezzanine. A glance over the edge of the platform reveals hanger brackets where the mezzanine would have been. This station was fully renovated in 2013. Artwork Dom (Variations), Laura F. Gibellini, 2014. Island platform, two tracks, with a mezzanine to the fare control and the street. A south mezzanine at this station has been removed. This station was fully renovated in 2013. This station features an extremely wide island platform, originally built to handle transfer crowds to the BRT trolley depot (now a bus depot). This station is on an embankment. There is a full mezzanine, with the south stairs descending to the street part way with ramps to the bottom. The north exit is at grade level. The Fresh Pond Yard is to the northwest of the station. This station was fully renovated in 2013. Two tracks with one island platform. Bumper blocks at the north end. A station house is at the north end of the platform. The station house is red brick with tile floor. The exit to street is at grade level. A tower is at the south end of the station. This station was rebuilt in 1974 after a fire destroyed the original wooden platform and station house. This station, also known as Myrtle/Broadway, has an in-service lower level described on the BMT Nassau Street-Jamaica Line page. 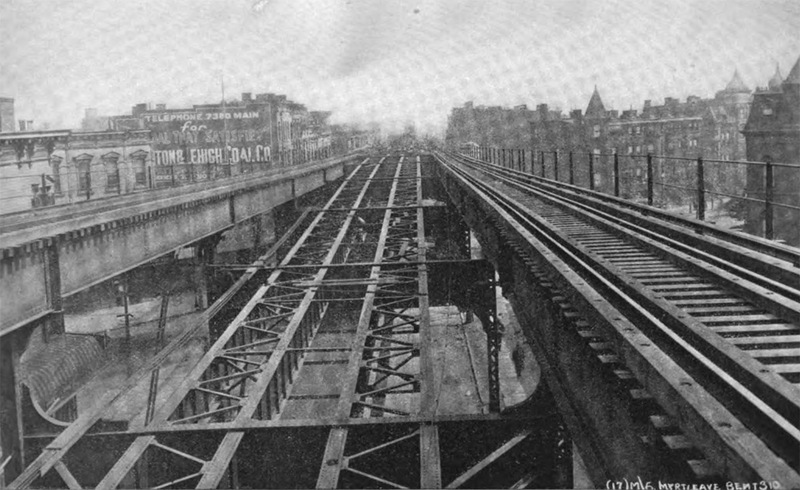 The upper level, crossing the lower level at an angle, consists of an island platform in between two trackways, formerly served by the Myrtle Avenue elevated line, which ran south of here to Myrtle Ave. and Jay St. The section south of Broadway was closed in 1969 and the upper level station was abandoned. Stairways from the upper level platform led down to both of the lower level platforms. The upper level platform was used as a crossover for passengers on the Jamaica Line, even after abandonment of the Myrtle El service, but this has long been discontinued. A tower for the Myrtle El and junction was on the upper level but this too has been closed. The trackways and steel structure continue some ways south of Broadway. For detail of the track configuration in this area see the Myrtle Avenue Area Track Map.